By Kori ~ February 9th, 2012. Would you like a quick suggestion for a good wine to drink tonight (or this weekend) that wonâ€™t break your budget and is widely available? Many of our readers have said this is something they would like, so here is this weekâ€™s selection, the 2011 Frisk Prickly Riesling from the Alpine Valleys region of Victoria in Australia. Nestled in the Northern foothills of the Victorian Alps, the Alpine Valleys is home to grape growers whose ancestors arrived in the 1850s after a less-than-comfortable boat trip from Italy. 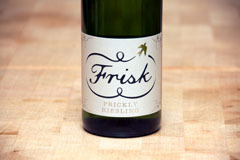 A team of seasoned winemakers who ferment free-run Riesling juice with yeasts that produce a gentle spritz makes Frisk Prickly Riesling. For tonight, and tomorrow, and next week! Cheers Kori!